On Thursday's Today, Meredith Vieira tossed mostly softballs to Senator-elect Al Franken, offering no tough questions about the disputed 2008 election, instead fawning, "...Are you more worried about becoming a target for the GOP or a target for Saturday Night Live, your old stomping ground?" In regards to the post-election wrangling for the Minnesota Senate seat, the best Vieira could do was to wonder, "It did get a little contentious, didn't it?" To be fair, she did reference the closeness of the election. Noting Franken's 312 vote margin of victory, Vieira observed, "Are you conscious of that as you head to Washington D.C. next week?" However, there was no mention of the reports of irregularities in the state. If the co-host wished to challenge the incoming senator, she could have read from a July 1 Wall Street Journal  editorial which asserted, "Mr. Franken now goes to the Senate having effectively stolen an election." Today has a history of fawning over the former comedian. 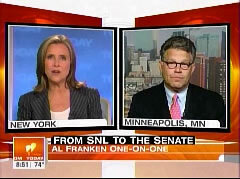 On May 29, 2007  , reporter Jamie Gangel informed viewers that Franken is "smart" and "Harvard smart." MEREDITH VIEIRA: Now to politics and the man who will give the Democratic Party a super majority in the U.S. Senate. Following 239 days of legal wrangling, Minnesota's Supreme Court now declared former SNL cast member Al Franken the state's junior senator. We spoke on Wednesday and I began by asking him how it feels to be senator-elect. SENATOR-ELECT AL FRANKEN: It sounds good. Senator is going to sound just a little bit better. VIEIRA: Just a little bit better. Well, this has been a long time coming. You are a guy known for your great sense of humor. You kind of shoot from the hip a lot. Was it hard to keep your mouth shut and just let this thing, sort of, play out over the past seven-plus months? FRANKEN: Well, fortunately I lost my sense of humor right away. So, I didn't have a problem. VIEIRA: It did get a little contentious, didn't it? FRANKEN: Well, I tried not to make it about that, and it, you know. Minnesota has a real process here. Minnesotans should be proud of our process. It's thorough. We can say that. And it's transparent, and our election officials acted with incredible integrity. So Minnesotans should be very proud. VIEIRA: You talk about a close election. 2.9 million votes were cast. You won by just 312 votes. VIEIRA: Are you conscious of that as you head to Washington D.C. next week? FRANKEN: I'm very conscious of it. I know that there are a lot of Minnesotans who didn't vote for me and it's up to me to show that I'm going to be working for them. You know, there's going to be a lot of talk and you brought it up, the talk of super majority. I don't see myself as the 60th Democrat in the Senate. I see myself as the second Minnesota senator. VIEIRA: And finally, are you more worried about becoming a target for the GOP or a target for Saturday Night Live, your old stomping ground? FRANKEN: I'm not worried about either. I'm most concerned about hitting the ground running, and getting the job done.